SCVHistory.com | Run-Up to Placerita Canyon State Park Formation, News Reports, 1940s. Run-Up to Placerita Canyon State Park Formation. Los Angeles Times | Wednesday, January 22, 1947. 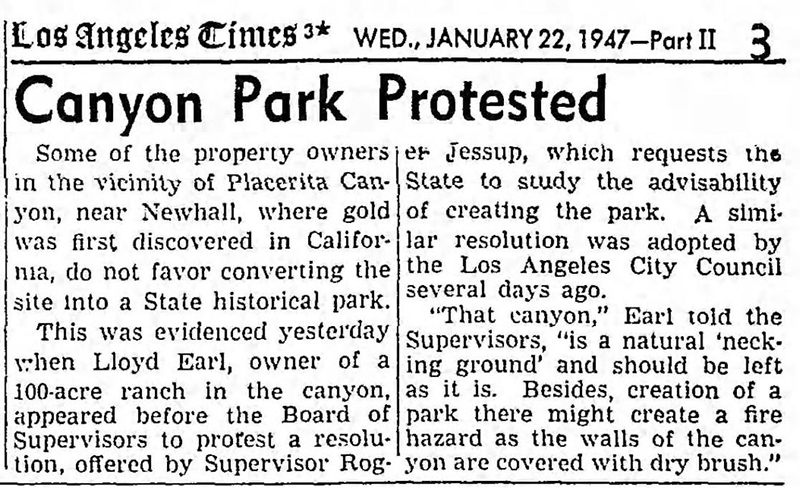 Some of the property owners in the vicinity of Placerita Canyon, near Newhall, where gold was first discovered in California, do not favor converting the site into a State historical park. This was evidenced yesterday when Lloyd Earl, owner of a 100-acre ranch in the canyon, appeared before the Board of Supervisors to protest a resolution, offered by Supervisor Roger Jessup, which requests the State to study the advisability of creating the park. A similar resolution was adopted by the Los Angeles City Council several days ago. "That canyon," Earl told the Supervisors, "is a natural 'necking ground' and should be left as it is. Besides, creation of a park there might create a fire hazard as the walls of the canyon are covered with dry brush."